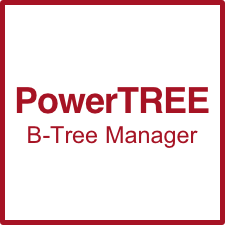 PowerTree is a fast B+Tree manager for Windows that can index more than two billion records with no limitations on the type of data file. PowerTree manages indexes to data. Any data, any format, any usage. PowerTree offers a concise, proprietary implementation of the highly effective B+Tree algorithm for indexed data management. Create one index or many. Use one data file or many, always in the format of your choice. There are no arbitrary limitations. Retrieve data sequentially, by exact match or approximation. PowerTree is easy to implement. There are only 14 functions to learn, not hundreds. Create or open an index. Add a new entry. Delete or search for an entry. Find the first, last, next or previous entry. It’s that easy! And in Windows, the DLL interface is industry standard, for immediate, effective use with virtually any programming language. There are no royalties or fees for distribution with your application.